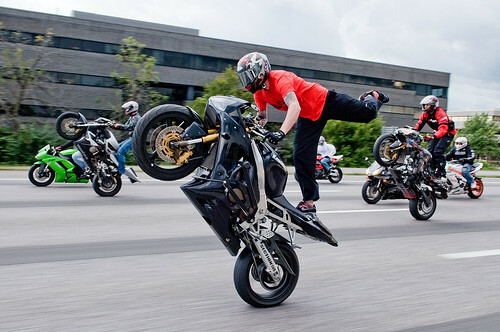 Local street-bike stunters “The Streetfighterz” hold an annual event in St. Louis called Ride Of The Century. In a nutshell this event consists of a large highway ride followed by a lot session somewhere in the city. Every year holds new surprises. The only thing organized is where and when the ride starts. Police, traffic, luck, and the law of averages make up for everything else that happens. The photos below consist of The Streetfighterz (AZ, DJ, Vaughn, and Sit Down Steve), Section 518, Grahm, and several other unknown riders. I have been working with these guys for the last 4 -5 years helping them out with events, sponsorship, shooting video, and just hanging out. I have been waiting to shoot this event ever since I picked up a decent still camera and lens last November. My boy Keith Mokris came in town from Cleveland to shoot stills and video. He is super talented, look him up at www.keithmokris.com. Here we are below snapping away on highway 44! This gives you an idea of how wild this ride really is! Shooting With Mokris – ROC 2009 from Wes Allmond on Vimeo. Click the tiles to view……. Click here for the full set on Flickr….